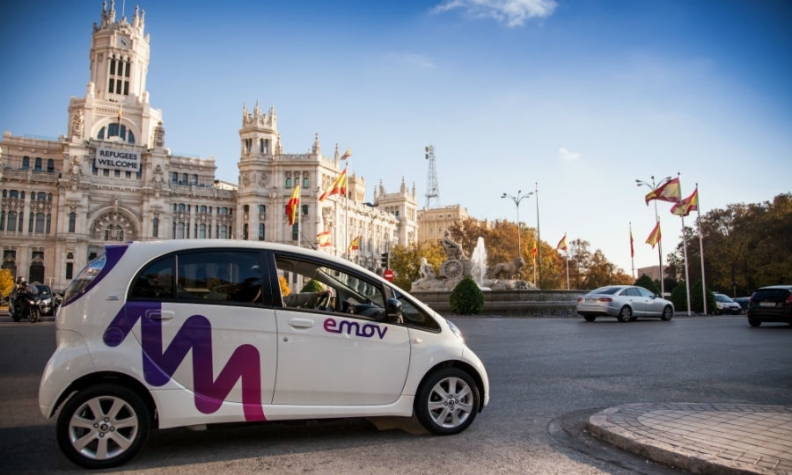 emov provides access to 500 Citroen C-Zeros in Madrid. MADRID -- In Madrid, the future of the auto industry is starting to take shape, and it’s clean, cheap and shared, reflecting the challenges looming over the conventional car. More than 100,000 customers joined Emov, a new electric-car service backed by PSA Group, in just five months. It’s catching up with Daimler's Car2Go, which has 166,000 subscribers to its fleet of 500 battery-powered Smart cars in the Spanish capital. Emov rents electric Citroen C-Zero models by the minute in a bid to woo consumers such as Juan Manuel Diaz-Pines. The 32-year-old marketing developer uses services like Car2Go and Emov to rent a car for just the 10 minutes he needs to get to Real Madrid soccer games. "I try to rent a car every time I go to the stadium," said Diaz-Pines. Madrid's embrace of electric vehicles is encouraged by the city council, which allows them to circulate in restricted zones and park almost anywhere for free, driving down operating costs and prices. Car2Go users in the city pay 21 euro cents per minute, compared with 24 cents in Berlin, 29 cents in Stuttgart or 31 cents in Amsterdam. That may explain why Car2Go's Madrid vehicles are rented as much as 15 times a day on average, the highest rate anywhere in the company's 26-city network. "The city is now a kind of benchmark for our future business development," said Thomas Beermann, CEO of Daimler's Car2Go service in Europe, in a phone interview. "Nowhere else are so many people having a positive experience with an electric vehicle." For carmakers like Mercedes-Benz parent Daimler and PSA, that means transactions of a few euros rather than tens of thousands. And with a quarter million consumers served by just over 1,000 vehicles in Madrid, the more successful the services, the less demand there might be for private cars. Still, that's better than leaving the space to ride-hailing operators such as Uber Technologies, Alphabet's Waymo and China's Didi Chuxing. Renault and Spanish infrastructure operator Ferrovial are also in talks to set up a third electric-car operator in Madrid, Thierry Koskas, Renault's head of sales and marketing, said in Paris on July 17. "Some car owners will sell their vehicles and some potential car buyers will delay vehicle purchases as the availability of shared mobility services grows," according to the Bloomberg New Energy Finance's Electric Vehicle Outlook 2017. Drivers averaging around 8,000 kilometers (4,972 miles) per year or less "are most likely to sell their vehicles or delay purchase decisions as shared mobility services become available in their cities," the report said. Customers worldwide will reach 16 million in 2017 and will rise to 44 million in 2025, according to Frost & Sullivan data. To be sure, the spread of electric rental cars on Madrid's streets has also stoked some tensions. Car2Go suffered attacks on about 70 cars in its Madrid fleet from December 2015 to April 2016. Taxi drivers say they resent the spread of rival transportation services, including ride-hailing operators such as Uber and Cabify as well as Car2Go. "These companies are actually occupying a public space to earn a private profit," said Jesus Fernandez, deputy chairman of the Madrid Professional Taxi Federation. "The city administration must regulate their expansion." Meanwhile, Diaz-Pines is starting to plan his trips by electric rental car to watch Real Madrid at the Bernabeu stadium as a new soccer season gets underway. "The downside is that finding a car after the game is getting harder and harder," he said. "People start looking for them at half-time."